With apple production greatly affected due to changing climate in Himachal Pradesh, apple farmers are taking to cultivation of vegetables and ‘low chill’ fruits, such as pomegranate and kiwi. Hill farmers are steadily moving towards other options, particularly in low and mid altitude (1,200-1,800 meters) regions of Kullu, Shimla and Mandi districts. They are following intercropping in apple orchards with vegetable crops as well as low chill varieties at lower elevations (1,000-1,200 meters). Farmers are also taking to protected cultivation of vegetables and flowers in a big way. 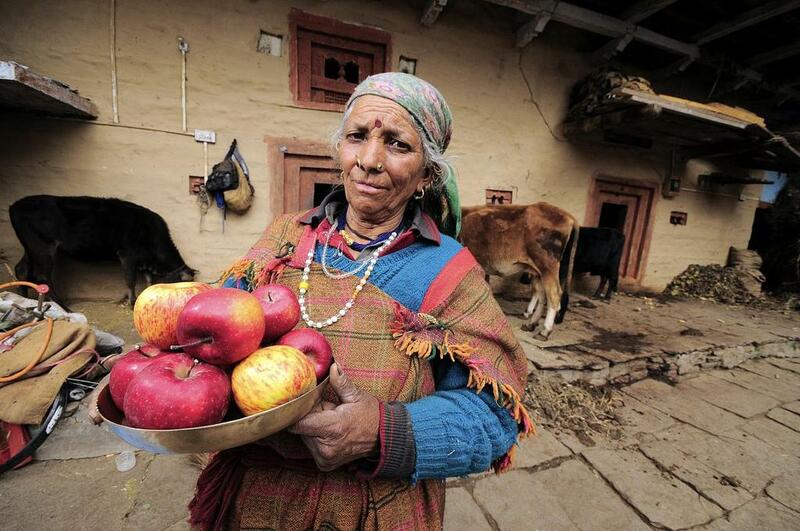 Apple farmers in Kullu valley are growing pomegranate, kiwi and vegetables such as tomato, peas, cauliflower, cabbage and broccoli. Apples can be grown at altitudes 1,500 to 2,700 meters above mean sea level in the Himalayan range which provides 1,000 to 1,600 hours of chilling necessary for production of good quality apples. As the region experiences warmer winters and erratic snowfall, the apple growing belt – known as apple line- is shifting to higher altitudes. A warmer winter in lower elevations has resulted into shifting of apple to higher elevations. In dry temperate regions of the state, increased temperature and early melting of snow since 1995 has shifted apple cultivation to higher reaches of Kinnaur (2,200-2,500 meters). “Abnormal climatic factors during winters, flowering and fruit development stage have lowered apple productivity of the state,” said S K Bhardwaj, professor at the Department of Environmental science, Y S Parmar University of Horticulture and Forestry at a media workshop in Shimla on climate change. He said apple productivity in the region has seen dropped at the rate of 0.183 tonnes per hectare every year from 2005 to 2014. The overall drop in productivity is 9.405 tonnes per hectare in the past two decades. Warming winters have reduced chilling hours required for apple production. Chill unit hours in Kullu region, for instance have decreased at the rate of 6.385 chill units per year and an overall decrease of 740.8 chill units in last thirty years (1986-2015). Less number of chilling hours results in delayed foliation, reduced fruit set and increased buttoning, all of which contribute to poor fruit quality. “The highly suitable apple production areas are now restricted only to higher hills of Shimla, Kullu, Chamba, dry temperate zones of Kinnaur and Spiti areas. The moderately suitable areas have now become marginal for apple production in the state,” he added. Another major cause of apple production taking a hit is increased incidence of hailstorms during the flowering and fruit setting stages. The hails accompanied by other variable weather factors during 1998-99 and 1999-2000 dropped the yields to the minimum. The quality of the crop was affected during the stage of growth and development in 2004-2005. In April 2015, 0.67 lakh hectares crop area was affected due to hailstorms and unseasonal rains in the state. Many villages of Theog, Jubbal and Kotkhai were lashed with heavy hail storm grounding the unripe apple fruits in May this year. Although in some places, farmers have started using anti-hail guns, their effectiveness is still in doubt. “There is an urgent need to focus attention on studying impacts of climate change on growth development, yield and quality of horticultural crops. The focus should also be on developing adaptation technologies and quantifying mitigation potential of horticultural crops and their dissemination among farmers,” Srivastava added. Giving an overview of changing weather patterns in HP, Manmohan Singh (India Meteorological Department, Shimla) pointed out that monsoon season in HP is expanding but overall rainfall is on a decline. Most IMD weather stations are reporting increasing trend in temperature in HP and J & K in the past thirty years. Snowfall days in Srinagar and Shimla is showing a decreasing trend during the same period. Snowfall season in the state is shrinking with decreasing seasonal snowfall and snowfall days.